Want to save money when shopping? Whether you need groceries, clothes, or items for your home, you’ll need to join a store loyalty rewards program in order to get the most bang for your buck. 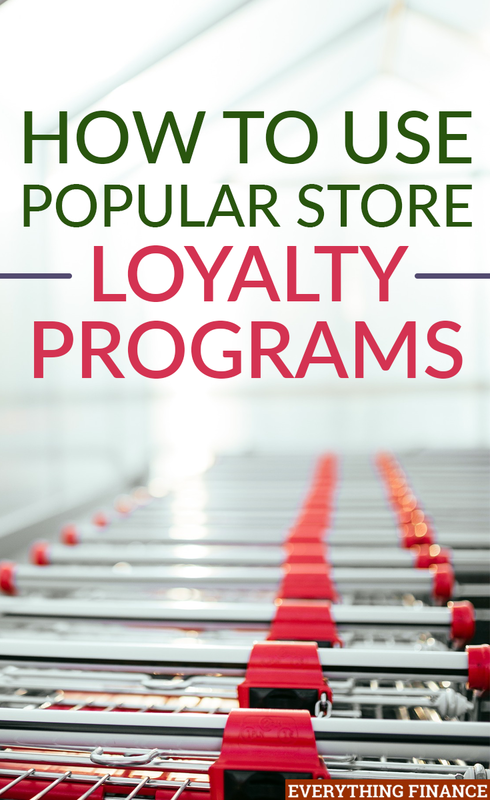 If you have favorite stores that you frequent, they may have loyalty rewards programs that provide extra discounts and offers to loyal customers like you. These programs are usually free to join and can help you save money and time. Plus, if you don’t like searching through the newspaper for coupons to clip, these programs have digital savings, which are a great alternative. Here are a few of the best store loyalty programs to check out when you’re looking to save on your shopping throughout the year. Who doesn’t like to shop at Target? It can get addicting because they generally offer everything you need at a great price. If you shop at Target quite a bit, you might as well take advantage of a few of their loyalty rewards programs. For starters, there is the Cartwheel app which is available on Android and Apple devices. In order to use the app, you just need to have a Target account. With the app, you can use your phone to scan products in the store to see if there is a coupon available for a particular item. If you don’t want to scan specific items, the Cartwheel app will also collect information on sales occurring throughout the store and provide you with coupons so you won’t have to put forth the time and effort to search for them manually on your own time. If you are a frequent Target shopper, the Target REDcard is a must. It allows you to save 5% on everything you purchase in the store. You can either opt to sign up for the credit card version of the Target card or connect it to your checking account so you can save 5% just by using your debit card in the store. The signup process is easy and it will be a great way to save on holiday shopping in future months. These two rewards features make Target one of the best places to shop for groceries and home goods. Walgreens may say they’re at the corner of ‘happy and healthy,’ but they’re literally on almost every corner in my area. Needless to say, a lot of us probably drive past a Walgreens store almost every day. Walgreens has a Balance Rewards Program that allows shoppers to save money on regular purchases like photos and prescriptions. Walgreens’ Balance Rewards offers 10 points per every $1 spent along with bonus points for featured items they rotate every week. Special prices for certain items are also advertised all over the store for Balance Rewards members only. While this rewards program lets you earn points on in-store purchases, you can also earn more by making healthy decisions like walking, running, testing your blood pressure, riding your bike, and more. If you already lead a healthy lifestyle, cash in on it by signing up for this rewards program and purchasing all your prescriptions and medicine, photos, and other items from Walgreens to rack up points. Pro Xtra is Home Depot’s loyalty rewards program that is a great option for contractors and homeowners who take on DIY projects. Customers who join the loyalty rewards program can save on items like paints and stains, primers, tools, roofing materials, the best Velux Blinds, and more. If you do contract work, you may be able to take advantage of more of the perks involved with being a Pro Xtra member. While Pro Xtra is best for professional contractors, it’s free to sign up and regular DIYers and shoppers can also take advantage of some of the program’s benefits including bulk discounts, volume pricing discounts, online ordering, dedicated pro hours and store parking, advanced order pulling, flexible credit options, and flexible delivery and pick-up options. Kohl’s is one of my favorite stores to shop at for clothes for my family, among other things. There’s always a sale going on and there’s always something on clearance, which I love. They also have a pretty neat toy selection along with an impressive home goods section. Frequent Kohl’s shoppers can sign up for the store’s Yes2You rewards program which provides members with a $5 reward for every 100 points. Shoppers earn 1 point for every dollar spent, so if you spend $100 in the store either at one time or over a period of time, you’ll earn a $5 reward – just like cash back for your purchase(s). It’s that simple. Members also receive 8 exclusive offers per year along with a birthday gift. There are also opportunities to earn more rewards in addition to receiving 1 point per dollar spent. If you are interested in adding the Kohl’s charge card to improve your savings strategy, the card helps you save 15-30% every year, and new card holders get 25% off their first purchase. When you need to shop, loyalty rewards can certainly come in handy. However, you shouldn’t overspend or go out of your way to receive rewards – you just need to continue shopping with the retailer in order to see significant savings. It also doesn’t hurt to stock up. If you know you need something important that you and your family will use quite a bit, don’t be afraid to stock up on it and save big in the long run. The key to utilizing the benefits of loyalty rewards programs without having to deal with overspending is to stick to only a select number of programs. Don’t try to join them all if you aren’t a frequent shopper at a particular store. Have you ever used any of these loyalty rewards programs? What your favorite strategy for saving money money every day shopping?